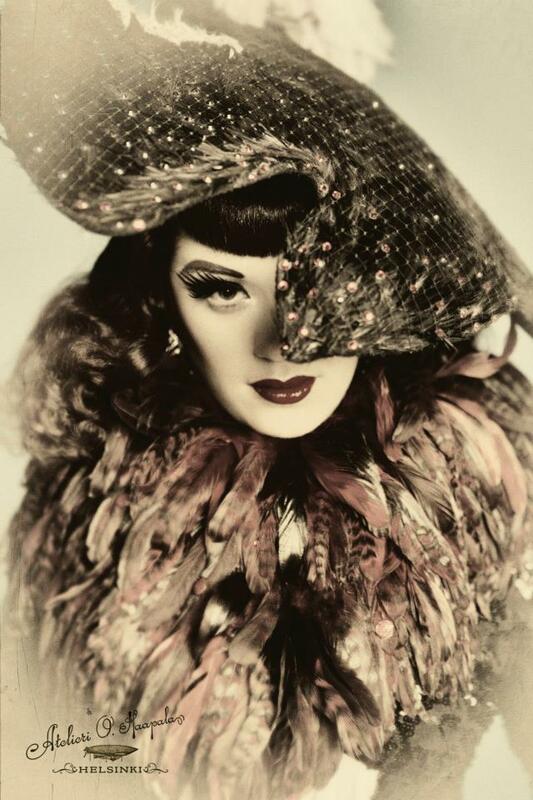 Lada Redstar: the “Hot Pinup from the Cold” performs at Lily Verlaine’s Nightcap June 8. Lada Redstar sits across the table at her friend Lily Verlaine’s studio, listening intently to the dinner conversation around her while imperceptibly multi-tasking. She’s quietly focused on twisting a cherry stem into a tiny knot with her tongue, and at the next pause in conversation triumphantly produces a neat little bow. She laughs in delight at the new tricks a lady can pick up when she puts her mind to it – especially when it’s a bit of a dare. Exquisitely beautiful and juicy in all the right places, Lada’s skintight deep teal dress wouldn’t be out of place on Madmen’s Joan Harris; her hair is a vibrant red inspired by Rita Hayworth (Lada’s #1 ladylove). All vintage pinup flourishes aside, Lada Redstar – fresh from her Burlesque Hall of Fame win in the “Best Debut” category – is a thoroughly modern woman. Hailing from Sarajevo, Lada’s title-winning debut at BHoF was her first ever American performance, although she’s been honing her skills for years. She took home the World Burlesque Crown at the 2012 World Burlesque Games in London, and has toured Europe and Australia extensively since her humble beginning performing at a rock show in 2005 (Eyelash + “special guest” was the first and last nameless billing Lada received). It was at a festival in Italy that her path to BHoF began. Seattle cabaret emcee and musician Armitage Shanks was performing at the same festival, and the two became friends over the course of the week. Armitage gave her a cd of his band Circus Contraption, and upon hearing the track “Insectavora”, Lada was smitten. She knew she needed to create an act specifically for the song. Armitage, keeping in touch long distance, was delighted to help secure permission from the composer and the track’s singer to use the song. The fantastical “Insectavora (The Queen of the Bugs)” – the act that would win her titles at BHoF and the World Burlesque games – was born. After the run of Australian shows, the two stayed in touch. As luck would have it, that fateful application led to a booking for Lada in Vegas. Lily flew in from New Zealand, Lada from Australia – and the two hunkered down to prepare for Lada’s turn in the 23rd Annual Tournament of Tease. The preparation leading up to the event was the most nerve-wracking of her life, Lada confided. “Then when I was backstage, I became calm. I enjoyed it so much.” As she took the stage and waited for her music cue, she could barely contain her excitement and accidentally cried out “I’M SO HAPPY TO BE HERE!!!! !” in the dark. Then came the music, and Insectavora took home “Best Debut”. Get tickets and read about Nightcap’s performers by clicking HERE. Lily Verlaine, Paris Original, Waxie Moon, Sara Sparrow, Iva Handfull, and Jasper McCann will join forces for one decadent late night rendezvous. ~ by angrytruffle on 06/07/2013.